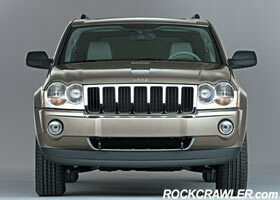 Auburn Hills, MI - Chrysler Group today announced U.S. pricing for its all-new 2005 Jeep® Grand Cherokee. With best-in-class off-road capability and best-in-class power, torque and towing capability, the 2005 Jeep Grand Cherokee is designed, engineered and built to master every imaginable day-to-day driving condition, whether on-road or off-road. The base Manufacturer’s Suggested Retail Price (MSRP) for the all-new Jeep Grand Cherokee is $26,775, including $645 destination. The Jeep Grand Cherokee will begin to arrive in dealerships this fall. Along with lower prices and more content, the pricing strategy will result in improved re-sale values and competitive monthly payments for Jeep Grand Cherokee owners. “Taking all this into consideration, it means the all-new Jeep Grand Cherokee’s durability, premium amenities, technological advancements and fuel efficiency will lead to an overall cost of ownership improvement for our customers,” said Bell. "Chrysler Group’s strides in manufacturing efficiency, quality improvements and our operating philosophy of disciplined pizzazz have allowed the Company to consistently introduce exciting, lower priced, all-new models with more content into the marketplace," said Craig Love, Vice President - Rear Wheel Drive Product Team. With an MSRP of $26,775 for 4x2 models and $28,745 for 4x4 models (including destination), the Jeep Grand Cherokee Laredo comes standard with a 3.7-liter V-6 engine mated to an all-new five-speed automatic transmission. The all-new five-speed automatic transmission provides an excellent balance of performance and fuel economy. The Quadra-Trac I full-time four-wheel drive system offers customers the convenience of full-time four-wheel drive. The system provides for smooth operation over a variety of road surface conditions. Brake Traction Control System (BTCS) is standard with Quadra-Trac I. BTCS utilizes the brake system to provide resistance to any wheel that is slipping to allow additional torque transfer to the wheels with traction. Other standard features on the Jeep Grand Cherokee Laredo include 17-inch Satin Silver finish wheels and tires, four-wheel disc brakes with ABS, four-way power driver and front passenger adjustable lumbar support, advanced multi-stage driver and front passenger air bags, tire pressure monitoring system and cargo storage with reversible load-floor and water-resistant storage compartment. The Jeep Grand Cherokee Limited comes standard with a 4.7-liter V-8 engine mated to a five-speed automatic transmission. The Quadra-Trac II 4x4 system provides full-time active four-wheel drive, which anticipates and prevents wheel slip for optimum traction during a wide range of conditions. It also includes the benefit of the Brake Traction Control System. The MSRP for Jeep Grand Cherokee Limited 4x2 models is $32,100 (including destination), while the MSRP for Jeep Grand Cherokee Limited 4x4 models is $34,690 (including destination). Other standard features on the Jeep Grand Cherokee Limited include power adjustable pedals with memory, rain-sensing automatic wipers, leather-wrapped steering wheel, electochromic interior rearview mirror, six-way power driver and four-way power front passenger seats, Infrared Dual Zone Climate Control, AM/FM stereo with six-disc in-dash CD with MP3 capability, Boston Acoustics six-speaker premium sound system with 276-watt digital amplifier and leather interior trim. A 5.7-liter HEMI V-8 engine (330 hp/375-lb. ft. torque) with the fuel-saving Multi-Displacement System and five-speed automatic transmission including Quadra-Drive II and Electronic Stability Program is also available on Jeep Grand Cherokee Limited models. The MSRP for Jeep Grand Cherokee Limited models equipped with the 5.7-liter HEMI V-8 engine is $37,860. Other available features include heated driver and front passenger seats, front and rear side curtain air bags, rear seat DVD system, UConnect hands-free communication, DVD Navigation Radio with integrated six-disc CD/MP3 player, SIRIUS Satellite Radio, rear park assist, off-road package with tow hooks and skid plates and chrome clad aluminum wheels. The all-new 2005 Jeep Grand Cherokee is built at the Company’s Jefferson North Assembly Plant in Detroit.